I don’t normally shop at warehouse stores (here’s why), but I have to admit the Food 4 Less Free Friday Download is pretty tempting. 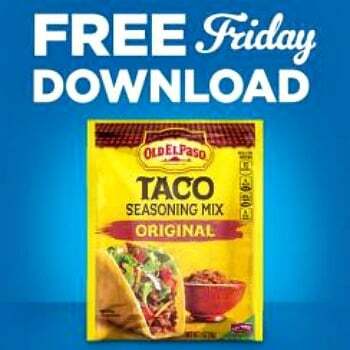 This week’s Food 4 Less FREE Friday download is for one FREE Old El Paso Seasoning Mix (1 oz., any variety)! Grab this Friday free download eCoupon on April 27, and redeem it by May 13. Tip: Want to take advantage of the discounts warehouse stores offer but have a small family? Consider partnering with another frugal mom to split the cost of membership (if applicable) and divvy up the bulk goods. What is the Food 4 Less Free Friday Download? Each week, Food 4 Less release a new Friday freebie eCoupon. This eCoupon could be for any of the thousands of products Food 4 Less stocks. You’ll go to the Friday free download page ON Friday and download the eCoupon. Sometime in the next 2 weeks (approximately), you’ll go to your local Food 4 Less, locate the Free Friday Download product, and walk out with it for FREE! Pretty simple, right? The only caveat is that you MUST get the Food 4 Less Free Friday Download eCoupon on Friday. Tip: As a busy mom myself, I know how things can slip through the cracks. To make sure I don’t miss out on the Friday free download, I set a re-occurring calendar reminder. Get started with this week’s Food 4 Less FREE Friday Download. Food 4 Less is a warehouse style grocery store that saves customers money by selling in bulk and doing away with frills. For instance, customers bag their own groceries and groceries are stocked in their original cases (rather than individually). The Food 4 Less brand was conceived in the 1930s by Lou Falley. The original Food 4 Less stores operated in Kansas and Missouri. Later, Falley franchised the Food 4 Less brand so that it could operate in additional states. Food 4 Less joined the Kroger family in the late 1990s. Kroger currently operates Food 4 Less stores in California, Illinois, Indiana, and Ohio. Note: All of the stores in the Kroger family participate in the Free Friday Download, so if you don’t live near a Food 4 Less you may still be able to score an awesome Friday freebie. See the Kroger Free Friday Download here.